Unfortunately due to the adverse weather conditions of snow and ice, the event on Saturday 2nd Feb is now cancelled. Runner and volunteer safety first. Thanks for your understanding. Please can we remind parkrunners of the importance of parking appropriately on a Saturday morning around the South Park. We are starting to notice a few more reports of bad parking, particularly the blocking of driveways of local residents, which is unacceptable. parkrun relies on the support of everyone involved and this includes local residents. We encourage you to arrive by foot, by pedal-power or by public transport if you can - your efforts help to reduce our impact on the park and the local area. If this is not possible please consider car sharing to reduce the number of cars that are around the park. There are plenty of parking facilities in the town centre, under a mile from the South Park. Some of these are free and for some there is a small charge. It also allows chance for a warm up and cool down! Please see the link at the bottom of this post for information on parking in Darlington town centre. We want to share our AED! Darlington parkrun owns an AED (automated external defibrillator) - an amazing bit of medical technology used to help those suffering cardiac arrest. They're easy to use devices which save hundreds of lives every year. Our defibrillator is currently only made available during Saturday 5k parkrun and Sunday 2k junior parkrun. We think it makes sense to make this potentially life-saving device available to the general public in South Park. We can do this by purchasing a special locked AED cabinet, which will be mounted to the wall of the Education Centre, next to the Clock Tower. The cabinet is opened using a keycode - this code will be known to the parkrun volunteer teams, and will be registered with North East Ambulance Service, who can advise the code to anyone who calls 999. AED cabinets are a proven, effective, secure way of making life-saving AEDs broadly available. We need your help! We have got permission from the council to mount the cabinet... we have a most generous offer to install the cabinet for free, from one of our lovely parkrun community... now we just need some money. 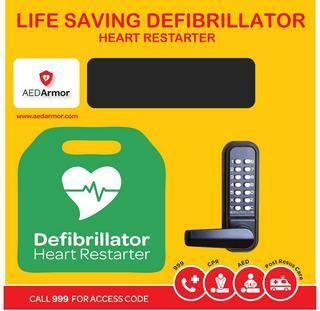 The cost of an appropriate AED cabinet is just £439, and we're asking for donations from the local parkrun community to fund this. You can ONLY donate to this appeal by visiting http://www.parkrun.org.uk/darlingtonsouthpark/aboutus/ and clicking the "Donate to parkrun" button. We'd love to donate access to our AED to the community, who let us enjoy the park every week. Thanks. Regrettably the parkrun is cancelled for Saturday 3rd March due to the adverse weather. Due to the vast amounts of snow and ice on the course which is unlikely to clear due to forecasted temperatures, we have made the decision to cancel in the interests of safety. Please spread the word. Event today is cancelled due to ice. There is a large section of ice at the bottom of the hill by the top gate - this is unlikely to clear by 9am and as such will be unsafe to runners.